An ancient coastal town with a picturesque old town core. Of all the towns on the Slovene coast, Piran as a whole has the most original town architecture, with a partly preserved town wall with seven mighty towers, a symbol of the past power and pride of the city. In the centre of the town is Tartini’s Square with a bronze monument of the famous violinist and composer Giuseppi Tartini. The most beautiful building in this square is an Venetian Gothic house from the first half of the 15th century, with a typical balcony and window trifora in Venetian Gothic style. The pictu­resque background of the square is rounded off by the cathedral on a hill with a fine view of the Bay of Trieste. The Church of St George (Sv. Jurij) gained its present Baroque appearance in the first half of the 17th century when the famous bell tower was complet­ed, a copy of St. Mark’s campanile in Venice . Behind the Renaissance facade is concealed a rich interior with altars and picture canvases from the Venetian school of the 18`h cen­tury, a wooden sculpture of St George on his horse and St Nicholas, the patron of sailors. The eight cornered Baroque baptistry next to the church with a built-in pre-Romanesque plaited relief is also worth mentioning. The baptistry still retains the old stone font, a Roman sarcophagai which once served as the babtismal font and a large wooden crucifix from the 14`h century. 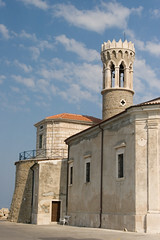 As an old town, Piran also has a number of other churches which conceal valuable historical and art objects. The most beautiful city well is situated in 1st May Square, built in 1776 and ornamented with sculptures of goddesses and mythical beings. Piran Town Museum contains valuable art works and archeological, historical and ethnological exhibits with special departments for seamanship, fishing and the history of the Piran saltworks, as well as a department where the famous violins and manuscripts of Tartini are housed. Piran is the seat of Coastal Galleries of Slovenia, which has become one of the most important exhibition centers of interna­tional and domestic art in recent years. And last but not least, the rich sea aquarium in Piran is well worth a visit. 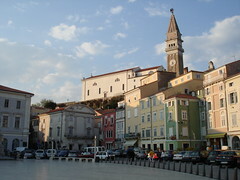 In Piran are many hotels and appartments available and especially in the nearby tourist resort Portoroz. 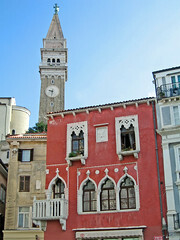 Hotel Piran is located in the centre of Piran near the town’s beach. Hotel Piran is a 4-star hotel with modern furnishings, almost entirely renovated in 2002. The hotel is situated in the heart of the town, overlooking the splendid Tartini Square on one side and the sea on the other. Free entrance to the casino in Portoroz. There are tennis courts, sauna, a gymnasium, beauty salon and massage parlour nearby. Your every need will be taken care of by our friendly staff.